Patrick Henry College operates an on-campus safety operation 24 hours per day, 7 days per week, providing an array of services. On-duty and on-call staff are specially trained to observe and report on all matters related to campus safety and are immediately available to respond to and handle any emergency that may occur on campus. Campus Safety consists of both armed and unarmed officers who are trained and registered with the Virginia Department of Criminal Justice Services. If a Patrick Henry College student is involved in an off-campus offense, Campus Safety officers may assist with the investigation in cooperation with local, state, or federal law enforcement. Campus Safety officers stay in communication with local police, fire department, and emergency medical services to facilitate rapid response in any emergency situation. 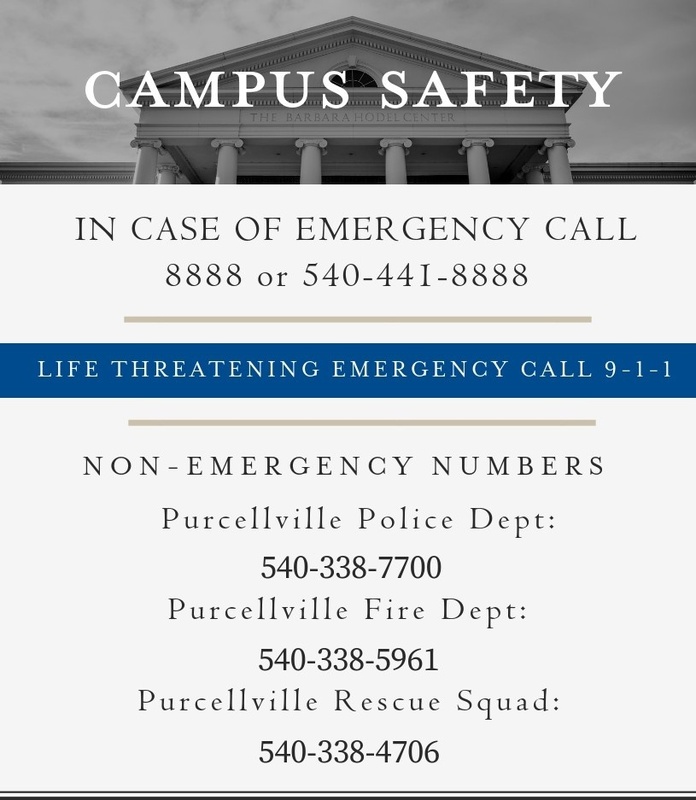 The Purcellville Police Department and Patrick Henry College have certain responsibilities for the safety of the students, faculty, staff, and visitors of Patrick Henry College. Each recognizes that cooperative and effective interaction is imperative to the successful accomplishment of their collective mission. We encourage students, faculty, and staff to be alert, to take precautions, and to report crimes and suspicious activities immediately to help us reach our objective. Working together, we can ensure and improve the quality of life at Patrick Henry College. The best way you can help us help you is by getting involved and learning what services are available through Campus Safety. Patrick Henry College is pleased to present all students, faculty, administrators, and staff with a personal safety application for use on smartphones. Designed to help campus safety and other first responders minimize response times during both emergency and routine security/safety situations, the free app provides everyone on campus with a hand-held, personal blue-light phone that connects the caller directly to campus safety personnel. The PHC personal safety app, which can be downloaded on either iOS or Android smartphones, has two main functions: an SOS (panic) button, and the ability to report an incident (i.e. medical emergency, suspicious person, alcohol/drug/parking violations, etc). Reports go only to the Campus Safety Office, and not to local authorities. When the SOS button is swiped, it calls the campus safety number and generates an “SOS” incident that is sent to campus safety personnel. (If swiped by accident, the user has 4 seconds to cancel the alert). Once swiped, the caller’s location will be visible to campus safety personnel, which will monitor and track the caller’s location until either campus safety resolves the incident or the user aborts the incident. When the user is off-campus, swiping the SOS will dial 911 and simultaneously alert Campus Safety. We welcome your suggestions and comments on how to make the campus an even safer environment. If you have any questions or concerns, please do not hesitate to connect with us: call Campus Safety at extension 8888 from any campus phone, call 540-441-8888 from any other phone, or e-mail us at campussafety@phc.edu.